Millions of years ago these rock crystals were created in what is now the mountains in northern Sweden. The stones in the Swedish Ice collection I have collected myself on hiking trips. Then I've sent them to my friend & stonecutter Victor Larsson (Lannavaara) to be cut. 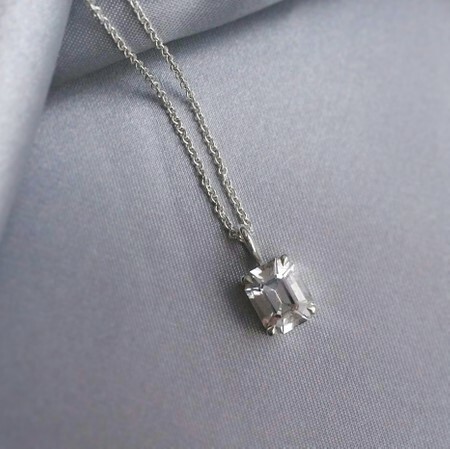 This necklace is made out of 925 sterling silver and an emerald cut swedish crystal quartz. The pendant is ca 17x8mm. A silver chain of 45-50cm is included. This piece of jewelry is made by hand in Sweden. The stone is found in Swedish Lapland and then cut in Lannavaara by stonecutter Victor Larsson. Love to keep the whole production in Sweden. This necklace is in stock and will be sent to you within 2-5 working days. Only one avaliable.